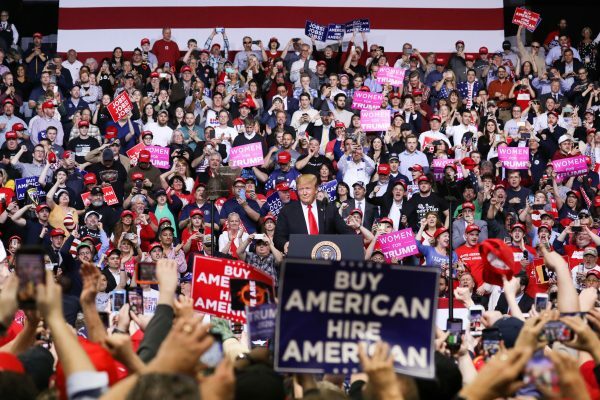 President Donald Trump’s reelection campaign will focus on exposing a dramatic shift toward socialism among the Democratic candidates while spotlighting the successes of the president’s administration, Kayleigh McEnany, press secretary for the Trump 2020 campaign, told The Epoch Times. McEnany said it would have been unimaginable a decade ago for Democrats, including former President Barack Obama, to push for the radical proposals embraced by every major Democratic contender for the 2020 election. “Every single member of the 2020 Democratic field will emerge with the scourge of socialism attached to them. They all want government takeover of health care, of energy, and with the Green New Deal. They want these radical proposals,” she said. According to McEnany, the campaign didn’t plan to take on socialism, but is making the adjustment given that the majority of the Democratic field has embraced the ideology. Of the eight Democratic presidential candidates who have officially declared their intention to run and are polling at 1 percent or more, seven support the socialist Medicare for All and Green New Deal policies. Sen. Amy Klobuchar (D-Minn.) is the exception among them, although even she has co-sponsored the Medicare for All bill and views the Green New Deal as a key long-term goal. “We’re going to expose it,” McEnany said. “You know, the facts don’t lie. Bernie Sanders back in 2013 and back when he was proposing legislation on single-payer health care, he had zero cosponsors. Now he has virtually the entirety of the Democratic field. “Same for free college and all of these socialists proposals that would cost our economy tens of trillions of dollars, raise everyone’s taxes, completely explode our debt. Only 18 percent of Americans view socialism in a positive light. While polling data for Medicare for All suggests that Americans support it, the approval rating drops significantly when the policy is described as “socialized medicine” or if respondents learn that the policy will result in tax increases and the elimination of private health insurance. Support for socialism is highest among the younger voters. McEnany believes this is because the millennial generation was excluded from the economy during the Obama years. “My peers—I’m a millennial—my peers couldn’t find jobs, they couldn’t find well-paying jobs, certainly couldn’t find a use for their college degrees,” McEnany said, adding that the trend is changing under Trump. The campaign will take the message of the administration’s success to the social media platforms where millennials spend much of their time, including Facebook and Twitter. “We do think that some millennials will come around and say, ‘Hey, yeah, I’m way better off today than I was four years ago. And that means I’ve got to vote for President Trump,'” McEnany said. Epoch Times staff member Charlotte Cuthbertson contributed to this report.